A Futon Gripper Pad is used to keep your Futon Mattress from Slipping on hardwood or metal futon frames. It is placed under the mattress, and will do a great job. 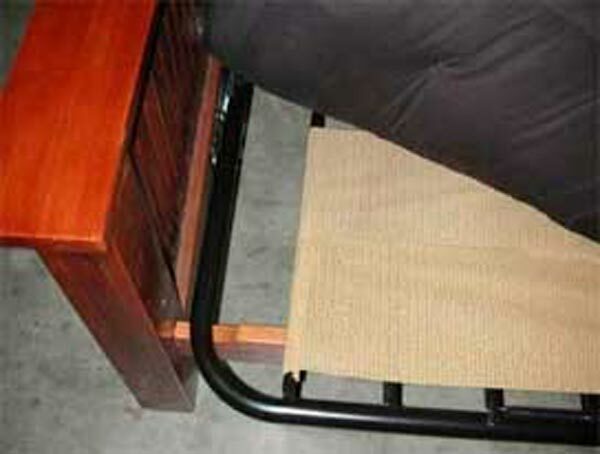 Our Standard Futon Grippers are 18" Wide and 60" Long. They are also top quality, Made in America, and are Anti Microbial, and Grip like Crazy! Made from a high grade Vinyl Compound over a polyester cloth. Features superior grip strength which keeps futons from slipping and sliding on any type of futon frame. Holds Futon Mattresses in place, while millions of tiny openings allow it to breathe. Can be easily cleaned with warm water and a mild detergent, rinsed, and laid flat to dry. Treated with MSM-Fresh anti-microbial to inhibit the growth of odor causing bacteria, mold and mildew. Fire-retardant and moth proofed, one size will fit any futon frame size. Guaranteed to maintain it's "non-slip" properties for 10 years with proper maintenance. 1 Length is Approximately 18" X 60"